Get ready to cheer on your favorite team at one of Indiana’s spirited sports bars. Enjoy classic bar food, a casual atmosphere, plenty of opportunity to watch your favorite team, and a jovial environment as you’re among like-minded fans. Here are the 10 best sports bars in the state. Part of the Salt Creek Golf Retreat in southern Nashville, Indiana is the 19th Hole Sports Bar. Open 365 days a year, seven days a week, this bar is the prime spot for watching the big game, adding up your score after a great round of golf or to just relax. There’s something for everyone here: great food, a full bar, juke box, corn hole, and the entire establishment is non-smoking. The bar also offers live entertainment on the weekends. Try a delicious basket of Hoosier fries or breaded pickle chips with a delicious veggie burger. Tony and his amazing staff pride themselves on providing a great experience, making them number one for visitors and locals. The best place in Lafayette to watch the game and have a great meal is Rookies. 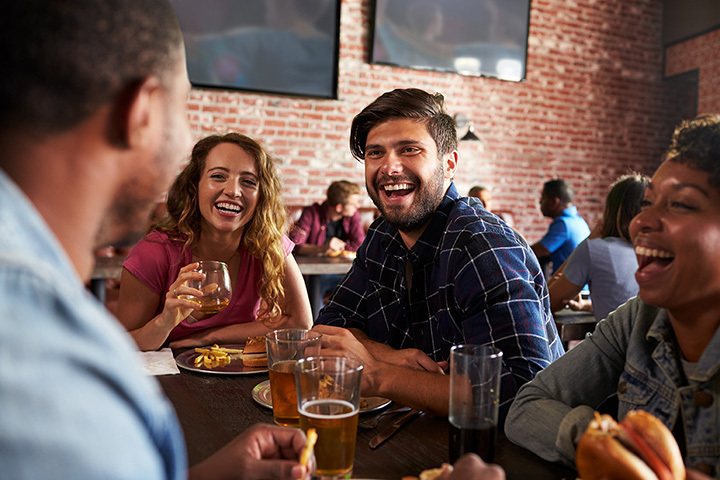 Whether you’re looking to relax after a long day at work, celebrate with friends, or just stopping by for a quick lunch, Rookies is the place to be. The motto at Rookie’s is, “Your Sports, Your Way.” Watch your favorite sport on one of their many flat screen TVs, or engage in a game of Silver Strike Bowling and Golden Tee Golf. Come to the Legendz Sports Bar and Grill in southern French Lick, Indiana, for a great place to watch the game, Indiana University games specifically, of course. Offering a great atmosphere and awesome customer service, Legendz has it all. Whether it’s homemade waffle fries or saucy Buffalo wings, Legendz has some of the best bar food in Southern Indiana. And before you leave, be sure to take a seat in the giant yellow “Legendz” chair outside. Blake’s Place is the spot in southern Indiana for watching a game, playing a round of pool, or relaxing with friends and family on a Friday night. Blake’s opened in 2013 and was named after a beloved man by the name of Blake Henson who passed away two years before. The bar was designed around everything that Blake loved in life: good food, great service, and entertainment. Enjoy a delicious, country fried steak with homemade mashed potatoes and green beans on Sunday or a scrumptious bowl of hot chili on a cold day. Snappers Sports Bar is considered a “hidden gem” in northern Elkhart, Indiana. Snappers is the place where everybody is welcome, the price is right, and you’re guaranteed to have a blast. Snappers serves up great food and awesome drinks, with their $1 Tuesday Tacos and 75-cent wings on Wednesday. It’s a neighborhood bar with 10 TVs to watch all your favorite sports. It’s where you can be yourself by yourself, or share a drink with family and friends. It’s also a family friendly establishment. Come to the Happy Hour Sports Bar and Grill in southern Celestine, Indiana, for good food, great drinks, and a great atmosphere to watch the games. Offering up delicious selections such as fried chicken, an incredible pizza bar, or barbecue chicken, the Happy Hour Sports Bar and Grill has it all. With a relaxed atmosphere circa 1950, this bar is the place to be. Before you leave, be sure to try one of their delicious homemade cinnamon rolls! Average Joe’s is the place where everyone is an all-American average joe. Average Joe recognizes that at one time, most people dreamed of becoming a star in the game that they loved. The wall at Average Joe’s is dedicated to those dreamers. Regular customers who dreamed of making it big, and some who eventually did. To become a part of the wall, bring in any sports item of your choice that holds fond memories that you don’t want and the staff will proudly add it to the wall of dreamers. It’s a casual, relaxed establishment to watch Monday night football, and indulge in a delicious basket of breaded onion rings or a big Joe burger. Willie’s isn’t your average sports café. It’s a neighborhood establishment, and features a fantastic view of Hidden Valley Lake. It’s a hidden gem in Lawrenceburg, one that everyone knows. The food is amazing, but it’s the view and the customer service that keep people coming back for more. It’s the bar where everybody knows your name. Try the grand slam nachos platter or a plate of Willie’s world-famous wings. They also offer Ye Olde English fish and chips and some of the best tacos! No matter what your taste buds desire, there is something for everyone here at Willie’s. Hoopster’s Sports Grill in southern Jeffersonville, Indiana, is the best place in southern Indiana to watch the game, have an ice-cold brew, and chow down on some of the best bar food around. Hoopster’s has been around since 1994, and prides itself on treating their customers like VIPs. Try one of their delicious kale and sun-dried tomato pasta salad with some loaded potato skins. A Hoopster burger and a basket of French fries is also highly recommended. Offering over 10 high definition TVs and live music, KnuckleHeads is the place to be in Michigan City. It’s the perfect place to watch the game, catch up with friends, or enjoy a night out. It’s your typical sports bar in style from the long wooden bar to the old hardwood floors. The atmosphere is relaxed and casual, and the food is incredible. Join them on Sunday for the half pound burger with large steak fries, and be sure to join them for their live entertainment on the weekends!